We will be printing a limited quantity run of these tank tops. They are only available by pre-order via the PayPal link below and you have till June 17th to order one. These are regular fit Gildan Ultra tank tops, choose sizes accordingly. Tanks will be delivered the first week of July and shipped for free if you live outside of Connecticut in the Continental USA. If you are interested in one please act now, this is a limited edition run and WILL NOT be available again this Summer! I'm not trying to push sales, just being clear that this is a one time only order! How much it cost for 50 or bulk orders? Same 15$ or with bulk order discount? 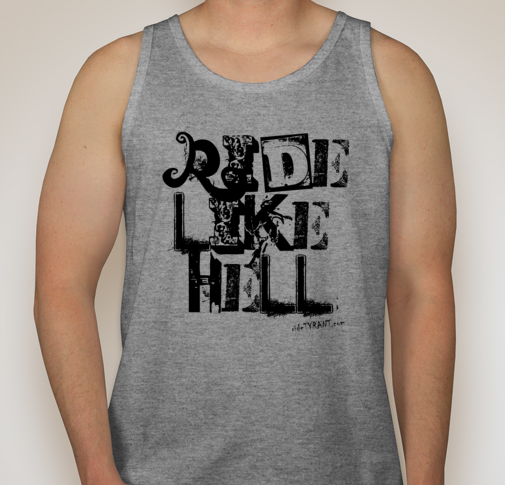 The $15 cost is on a custom print run of tank tops assumed to be less than two dozen (24). If anybody is interested in bulk/wholesale orders that is certainly an option. Contact me direct via ridetyrant@yahoo.com to talk specifics. After commenting back I realized the user name above was "Gildan Tee" and that it was tied to an active link to a shirt wholesaler. If this is some spammer...go fahq yourself! If this is a random user trying to show me that Gildan Tanks only cost $4.05, you def. know nothing about shirt printing. Assuming I have a run of 24 tank tops or less on this order I'll be paying $12.75 out of pocket per tank top! Factoring in shipping to me from the vendor, PayPal fees, and my time I make about $1.00 profit per tank. As always, that $1.00 profit goes right into sticker costs...stickers that are given out for FREE! I'd love to see any other company out there disclose their print costs. $3-4 per shirt and they are printed in China by a 5 year old....yet they still charge the consumer here in the USA $20. TYRANT has never been about making and money and it never will be.